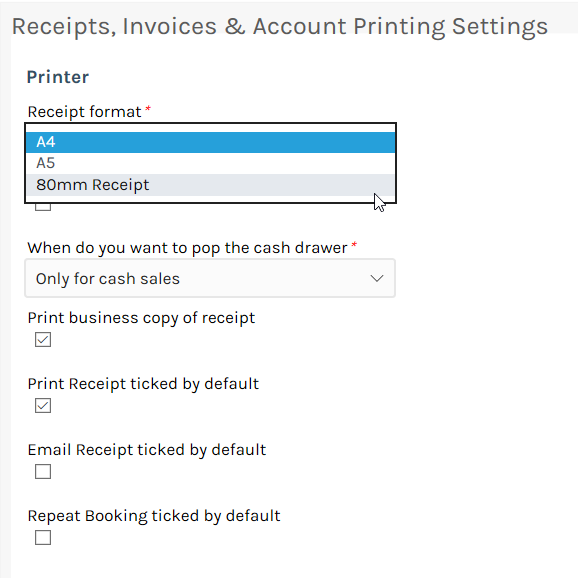 In the Settings screen , in the Printer section select 80mm Receipt as the Receipt format and tick the Print receipt ticked by default field to always print receipts when making a payment. Then click the Save Button. Select the type of printer you have in the Receipt printer type field. When performing a Sale, the Payment popup screen will automatically have the Print Receipt field ticked. 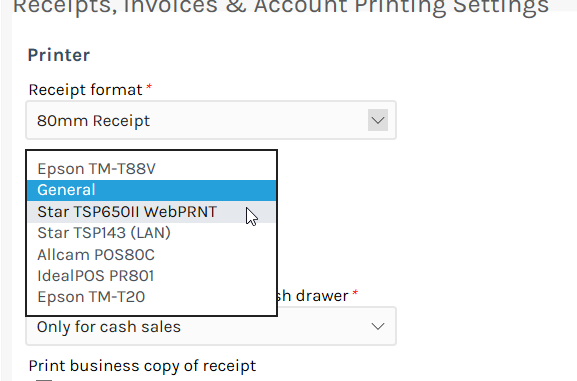 Click the Complete Payment Button and wait until the Print Preview of the receipt shows before adding a Repeat visit, this may take a few seconds especially when it's the first time you have printed a receipt. Once the Print Preview (in Chrome) of the receipt is shown, make sure the Default printer is the Thermal Printer and then click the Print Button. The Cash draw will open and then the receipt will print shortly there after. You can then continue entering the client's Repeat Visit details . If you are using Internet Explorer or Safari or any other browser that is using Adobe as the default PDF Reader, then tick the Portrait option in the Orientation section first then click the Print Button. The Cash draw will open and then the receipt will print shortly there after.